Are you at the age of 20-45? Ready to fire off you investing career? Do you want to learn how to pick the most profitable stocks, watch them grow, and make millions of dollars? 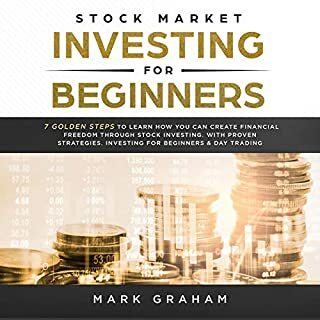 Stock Market Investing for Beginners provides 25 easy to understand lessons with proper guidance and proven strategies for you to boost your investing career. Discover what you need to know about investing and conquer the stock market. Stock market investing is a very lucrative way to make passive income and eventually make a fortune! 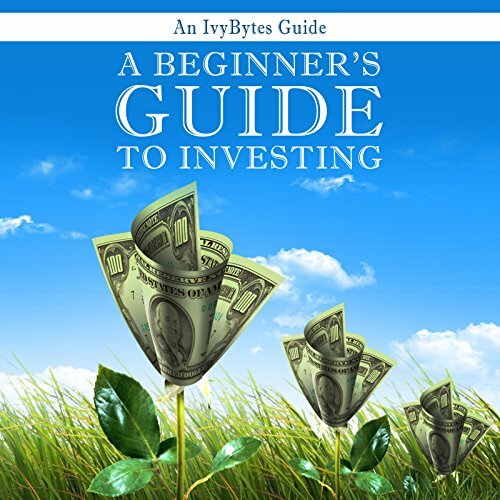 If you want to learn how to invest, this book is the ultimate beginner investor guide. It does not matter how old you are: as long as you are willing to follow the contents discussed in this book, you will undoubtedly grow your wealth and get a little closer to financial freedom i.e. a place where you can enjoy the freedom of not having to work for money to make ends meet. The idea is to be smart, and as you know, you cannot be smart without knowing - i.e. without having the necessary information. You will find everything you need to know to ensure that you are able to invest wisely in your future. First, you will learn about the reason investing in the stock market makes sense, what you need to know to get started, and the lingo you can expect to hear on a regular basis. Next, you will learn all about the mindset that successful investors have, as well as how to cultivate it for yourself and much more. This book details some of the proven steps and strategies that will help you to become a successful trader and investor in the stock market. This three-book bundle will break down everything you will need to know. You will learn a lot on the basics of investing and trading. What you need to understand most is the idea of ensuring that you have money working for you. If want to profit from what Forbes Magazine is calling “…the best ground floor opportunity we’ve seen since the early days of the internet.” then keep reading. The legal marijuana market is now growing at the same speed as the broadband Internet market in the early 2000s. Certain stocks have risen more than 5,000 percent in the past 5 years, which means a small $100 investment would now be worth $5,000 or more. Learn how to invest your money the smart way. All forms of investment share a common purpose: to provide for a better future. Stock market investing is one of the best tools you can use to build a more secure financial foundation for you and your family. However, for those of us who aren't professional stockbrokers, the process of stock market investing can seem complex and bewildering. Why are so many regular investors getting rich off marijuana stocks? The marijuana industry is the hottest on Earth right now.... And the US legal marijuana market is projected to triple in size over the next three years.... Many early adopters have made a small fortune with the right plays. These people weren’t industry insiders either. They didn’t have special connections to marijuana companies. They were regular middle-class Americans like you. 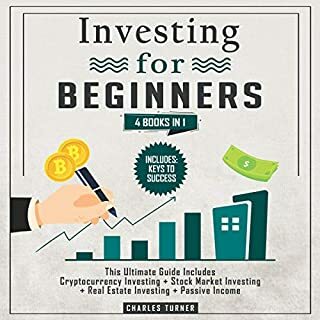 If you are looking for the best investing primer on the market today then consider your discovery of this book the first big event in a hot streak of good financial fortune. The Investing QuickStart Guide offers a simplified but expansive introduction to the world of investing. Author Ted D. Snow brings 30 years of experience in the finance industry to bear, much to the benefit of novice learners and experienced investors alike. Snow provides listeners with the complete picture on stocks, bonds, treasuries, ETFs, mutual funds, indexes, REITS, and several other investment securities. Do you want to start an additional stream of income for yourself? Would you like to be rewarded through investments without having to invest a fortune? Penny stocks are the perfect way for you to start out on the stock exchange and, contrary to their name, they are often worth far more than a single penny. 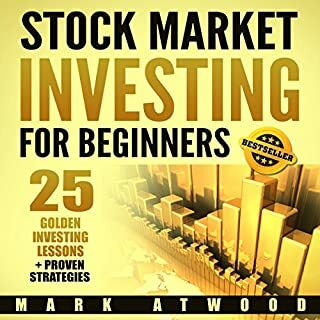 If you’ve ever thought that the stock market would be a great place for you to make some speculative gains, then this book is exactly what you need. for someone wanting to build their foundation. Throw away the get-rich quick schemes that never work and turn off the financial news and it's constant noise. Whether your dream is protecting your assets in a turbulent market or growing your wealth so that you can retire in style, this book is the blueprint. You can be a successful investor - really. 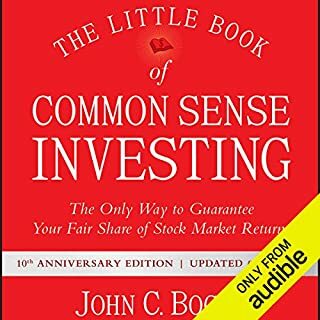 I would consider myself to be 90% novice in terms of investment planning, and found this book to be extraordinarily informative. The information is presented in a clear and easily to comprehend fashion, making the book an invaluable source of reference for establishing a strong foundational understanding necessary for successful investment and retirement planning. As someone who is 28 now, I'm so thankful to have access to this information to be able to begin educated financial planning for my future. I extend my sincerest gratitude to the author! What was one of the most memorable moments of A Beginner's Guide to Investing? I think it's quite telling when the author informs us that the long-term investment strategy is fool proof, since essentially the whole economic system is based on it's success. Once you understand that, it's much easier to concentrate on retirement investing, diversification, and asset allocation - wow! I finally realize what all of those words mean! What about Adam Verner’s performance did you like? Oh, Adam has a pretty steady/stable voice. He's extremely clear. I wouldn't want to see him emcee a wedding, but as a narrator, he gets 5 stars from me! Yes, the book made me cry when I realized how much money I have lost over the past several years by not investing my savings correctly. 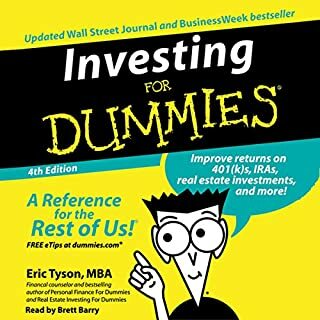 This is a very good book for anyone who knows a little about retirement investing (i.e., if you have taken the time to learn about your employer retirement benefit), and a little about the stock market, just so that one can understand enough terminology to understand this audio book. Although the book does a good job in providing definitions, it would be difficult to follow for someone who has no investment understanding what-so-ever. That being said, I think every beginner should listen to / read this book. It's practical, commonsense, and should make you understand, and give you the confidence, that taking your money out of that money market account, and putting it into yours and your spouse's Traditional or Roth IRA is one the best investment moves you could ever make! Such commonsense advice, and convincing through facts, and not fantasy. For some beginners, the book may leave your yearning for more. 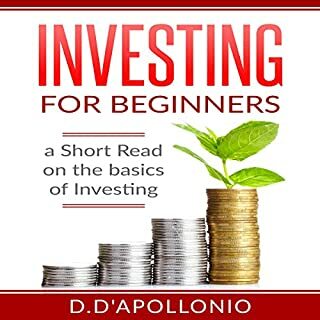 For example, in my case, by the end of the book I wanted to know more about exactly which investment products I should consider, or at least more tangible advice on how to identify such products from the milieu available in my low-cost brokerage account. I also wanted to know more about asset allocation, and how certain big changes in the economy, such as rising interest rates, might impact how I decide to allocate and/or reallocate my assets. The nice thing is that the author is active online and so you the discussion can continue after the book reading/listening is done! I loved every second of the audio book. I love how simple the author's approach was, I can wait to listen to it agian and then get out there and begin investing! If you could sum up A Beginner's Guide to Investing in three words, what would they be? It gave practical advice that enables me to invest more intelligently today, including specific ETF recommendation, and recommended % diversification to specific asset classes. It also provided enough info, that I could start understanding the tax benefits involved. What does Adam Verner bring to the story that you wouldn’t experience if you just read the book? If investing books are too boring for you to read yourself, this is the way to go. He touches on taxation, but does not really explain the tax benefits for the various account types, or the way that taxation occurs in private investments. However, he goes into the ideas a bit, which I appreciated. I understand 401k & IRA tax benefits better than I did, and I also understand that taxation can occur as you compound, rather than when you try to extract your investment (at least for some asset classes). All in all, a great intro to a topic that most of us know way too little about. Presents a perfect program to explain investing for real beginners. Very simply explained and organized. i love books that are straight to the point, i enjoy and appreciate stories included as long as they are short and not a ton of stories included. This book is perfect for someone who wants to start finacial investment. Its easy for anyone to understand and the information is hard to confuse as well as eye opening. Bringing a sense of confidence to anyone looking to invest in any and everything. Very informative but not overbearing. I walk away feeling fulfilled and educated enought to start investing wisely. The terminology lost me when he started going into the financial aspect. So since I have no knowledge in finances I found it hard to follow. If you are like me maybe finding the basics of finances to help with the meat and bones of this book. A clear and simple introduction to investing. And all you'll really ever need to be successful. Clear, concise, and easily understandable. Overall, I think it was well done. There are a few very controversial things he just sort of passes over. But it was obviously not meant to be an in depth book. Great for giving you definitions and general direction.